THE VENT BRUSH #D200 (For Fast Blow-Styling) : Accelerates the blow-drying process by allowing warm air to circulate directly at the root level. These brushes provide excellent grip and control, safely detangling all hair lengths and types without snagging. The following brushes are only available in black. 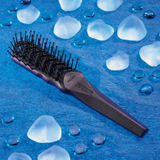 Same as D50 but standard size brush for medium or long hair.